Being debt free is a goal many Americans have, and experts and financial gurus equate being debt free with financial freedom. The conventional ways of buying things are to finance, lease, or pay cash. Let’s use a car as an example: If you were to finance a car, at the end of the loan payback period, all you’re going to have to show for the payments you made is your car, worth whatever the trade-in value happens to be at that point. If you lease the car, at the end of the lease you turn the car back in, and now you have nothing to show for the money you spent. Some people figure that they can beat the leasing and financing rackets by paying cash. So they start putting money aside into a savings account, but the minute they pull their money out to make a purchase, they’re earning zero interest on that money. That’s why all three methods – financing, leasing and paying cash – are losing scenarios – you’re either going to pay interest to finance things or you’re going to lose the interest you could have earned, if you kept your money invested instead. Most people continue to use these three methods because they’ve never been shown a better way. Bank On Yourself is a better way, because if you save up your money in a policy with the features and design necessary to maximize the power of this concept, you can then borrow the money to pay cash for a car – or whatever your heart desires – and your plan could continue growing as though you never touched a dime of it. In addition, over time you could recapture the money you spend on major purchases. As illustrated in chapter 13 of Pamela Yellen’s best-selling book, the average family could potentially enjoy an extra half a million dollars or more of lifetime wealth simply by running just their car and vacation purchases through a policy designed to maximize the Bank On Yourself strategy! Imagine being able to use and enjoy all those extra dollars – without taking on the risk or volatility of stocks and real estate. Bank On Yourself isn’t a magic pill – it takes a little patience and discipline. But if you have those traits, it can pay a lifetime of benefits. Note: To get all of these advantages, it’s important your policy be structured correctly and be administered by one of a handful of insurance companies that offer policies with all the required features. When you request a free Analysis, you’ll receive a referral to a Bank On Yourself Authorized Advisor who knows which companies to use and how to design your policy, so you receive the maximum benefit from it. A man from Minneapolis recently told us about how his ex-wife had gotten their house when they divorced, and like many others, she wanted to own it free and clear. So she plowed all her available money into paying off the mortgage. Unfortunately, she then got very sick and lost her job. Because of the depressed real estate market in their area, her house was by then worth much less, and homes in the neighborhood were taking a very long time to sell. Without a job or a regular income, no bank would give her a home equity loan or a new mortgage. She was forced to go on public assistance, because her money was now locked up in her home! Most people don’t realize until it’s too late that the equity in your home earns a zero rate of return, you have little control over it, it’s not liquid, and it gives you no tax advantages. Paying off credit cards and loans makes sound financial sense, of course, and that’s why some people try to pay off as much as they can each month. That often leaves little left at the end of the month for savings. One man in his mid-fifties from the Midwest was paying $600 to $800 a month more than the minimum payment due on his credit cards, in an attempt to eliminate his debt as quickly as possible. His Bank On Yourself Advisor ran an analysis and discovered that if he paid just the minimum balance due each month, and put the difference into a Bank On Yourself policy where it would grow for him safely and predictably, he could potentially have an additional $50,000 at retirement! 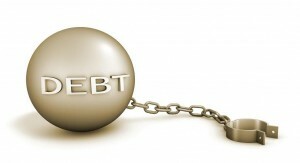 Are you curious to find out the best way to pay down your debt? When you request a FREE Bank On Yourself Analysis, you’ll discover the most efficient way to grow your savings while reducing or eliminating your debt. There are several ways to “jump start” a Bank On Yourself policy, so you don’t have to wait long to turn around and put your equity to work for you. If you borrow your equity to pay off the balance of a car loan, for example, and then start paying your policy back the way a Bank On Yourself Authorized Advisor will show you, you could recapture into your policy a portion of what you paid for that car, plus some of the interest you would have otherwise paid the finance company. And what about emergency expenses, like home repairs, medical expenses or an unexpected trip to help out a relative or friend? If, like many people, you covered those expenses by putting them on a credit card, take heart: You could recapture that money by borrowing your equity in the policy to pay off the card company and then making the loan payments back to your plan. We got hit with $15,000 of medical bills our health insurance didn’t cover, which we later discovered is quite common. Before Bank On Yourself, we would have been forced to put those unexpected expenses on our credit cards. But thanks to Bank On Yourself, we simply borrowed the money from our policies to pay the bills off in full immediately, which was a huge stress reliever. So, is there really something “Better Than Debt Free”? You bet!! Are you concerned where you’ll find the money to fund a Bank On Yourself policy? There are at least eight places a Bank On Yourself Advisor looks to help you do that.